Gemini: the Latin word for “twin,” and the constellation of stars that is sometimes seen as two lizards and sometimes seen as two men standing together. Myths and legends portray twins as a symbol of completion, two parts of a whole. The earth and sky, and the sun and the moon are often twins, each representing opposing sides of one element: the one cannot exist without the other. The night makes the essence of day, the earth gives the sky meaning. Jung wrote that all people have a shadow self made up of all the fear and repressions that they have experienced. The shadow self must be aknowledged, or it will eventually destroy its opposite. The black swan in Swan Lake represents the shadow self, the dark twin. This is where the story of the evil twin emerges. I found that in West African tradition, the primal beings called the Nommo, a being made up of twins, were seen as perfection, though they were split long ago. And then my search became convoluted because the Nommo are also the very beings that are said to have come down from space in strangely shaped vehicles. These lizard gods built the pyramids and taught people about the sky. Now they can be found in ancient Egyptian art wearing orb helmets like nemeses from a bad science fiction film. I found myself reading deeper and deeper into a conspiracy theory without realizing it: they built the pyramids, they understood the skies. I began jotting down notes, until I recognized the story from a late night of watching a Netflix documentary, my ex’s back to me. A frigidness settled all around in a waning gentleness. We originally fell in love because we recognized each other. We were too similar, and one night I found this documentary and turned it on as a joke. He didn’t think it was funny and went to sleep, but I watched into the night anyway. Here I was, falling for it again. I believe in magic, but I felt I was being lied to. So strange that I would fall for this story, and be betrayed on the very week that I was writing about Gemini. There’s something about the way two things look exactly alike but are exactly what they are: two. Each twin has their specific character that sets them apart. No matter how similar they appear, these character traits separate them like night is separated by day. Under the waxing moon of Gemini, you may not want to admit it, and you may not even know it, but you love a Gemini. This sign is feared more than Scorpio for the very reason that one has revealed itself and then lied to you in the past, and you accidentally had fallen for one. They’re cheaters. They’re liars. They’re social survivalists out for their own goals. Chances are Judas was a Gemini. But, still, they sparkle. Gemini's are artists the way they fall into change and weave beautiful stories of their experiences. 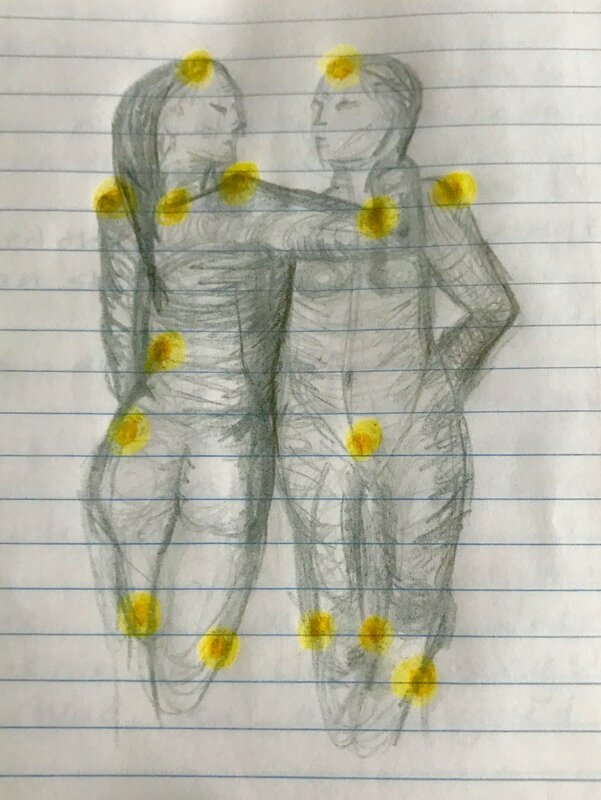 They are connectors, able to bewitch us, to make us believe. It was the Gemini in Stevie Nicks that made us fall in love through aching rhythm. Geminis don’t need to hold on to things the way we do. Change is like a fun little hop and a skip into a moment that, well, they might be able to profit from. While we’re lagging behind just trying to adapt, to find truth, we’re ugly and awkward while we do it. Truth is a spark for Geminis that they feel and understand immediately within themselves without the concern or weight of others. It’s interesting to look at twins in the context of gender. Male twins, like Remus and Romulus, like Castor and Pollux (the Gemini constellation), are generally builders, a successful partnership of love and social organization, development, and righteous self sacrifice. A male and female twin are the sun and the moon, the earth and sky, the land and the waters. They are the divine completion. Female twins, however, are much more psychologically motivated. Female twins are the dark and light. The Madonna and the whore, an ill-fated pairing like swan lake, there can never be room for two women. Beyonce isn’t having twins by accident, which makes me think many other people will follow suit with an injection. To bear twins sets their parents apart, and gifts the twins with a soul mate, as it were. They are the perfect partnership, needing no one in the world of their own union. They don’t need to live life searching. Like the Nommo. Have we been split in the past? Are we in search of our missing half? Or are we searching for an elusive species that does not exist? And if we find them, will they destroy us or will they provide proof that humans can be whole? The Constellation: Castor is a sextuple star system. It appears to be a blue-white star. A wide-set red dwarf star is also a part of the system. Pollux is an orange-hued giant star. Pollux has an extra solar planet revolving around it.